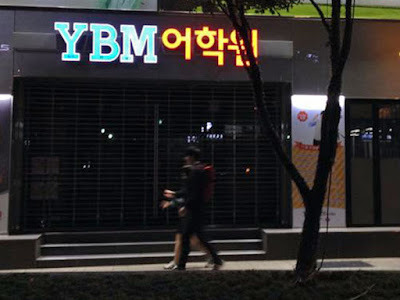 No, it does not stand for Ynternational Business Machines. It stands for Y.B. Min. We picked Raymen Beach Resort. And it seemed like everyone else had chosen Raymen too. Raymen Beach Resort was crowded. Almost all the rooms were taken. All the open cottages were occupied. The restaurant was full. 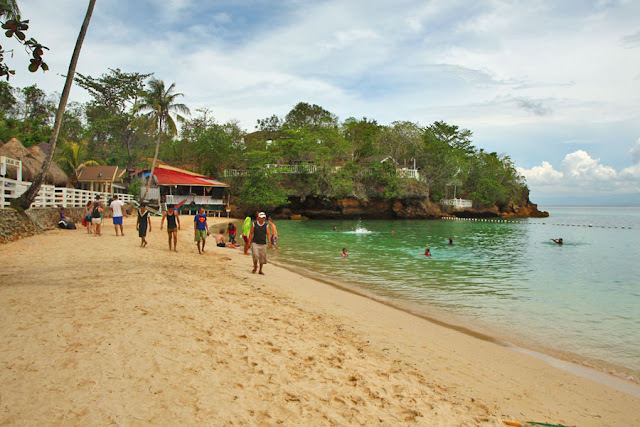 And the beach was swarming with people (while that of Alobijod Cove and Rico's Beach Resort were virtually empty). But still we chose to stay at Raymen Beach Resort (entrance fee of Php 25 per person, even if renting a room). Actually our wallet chose for us. And it chose Raymen's 700–peso room. The small room, with a wooden double deck bed and a very basic bathroom, was good for four persons. The ceiling was so low that I had to watch my head when climbing to the upper deck to avoid getting my mustache tangled in the ceiling fan. The wooden bunk bed was so wobbly and creaky, every time I climbed down from the upper bunk, the whole bed would shake, rattling my two friends awake who were sleeping on the lower bunk. But for 700 pesos, we couldn't complain. 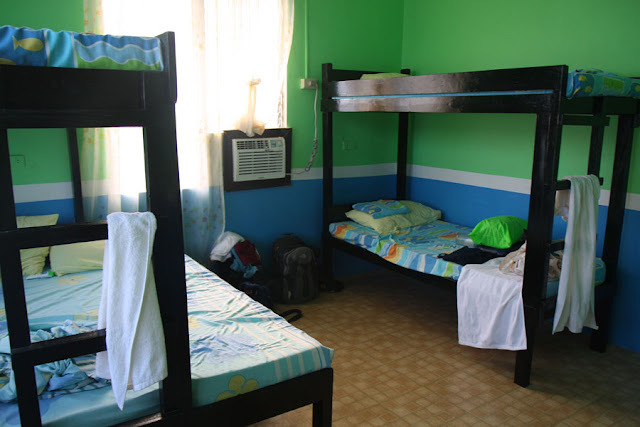 After all, our wallets were too cheap to spend for an air-conditioned room (Php 1600 up to Php 2700 for 3–4 persons) in the newer buildings of the resort. We ate our every meal at the resort's restaurant (corkage fees apply). Their food was okay and affordable, although could take a long time to get to the table especially when the restaurant is full. While waiting for the food, we kept ourselves busy by chatting, checking social media (WiFi is available only at the restaurant and at the reception area), and eating mangoes that were sold in the resort (sweet mangoes verified!). When we got too full to eat another bite of mango, too full to sleep, too full to swim, we went island hopping. But because we didn't book Raymen's boat ahead, we were pointed to the Alubihod Motor Banca Owners Association (AMBOA) booth (aka Island Hopping Station) on the beach between Raymen Beach Resort and Alobijod Cove Resort. 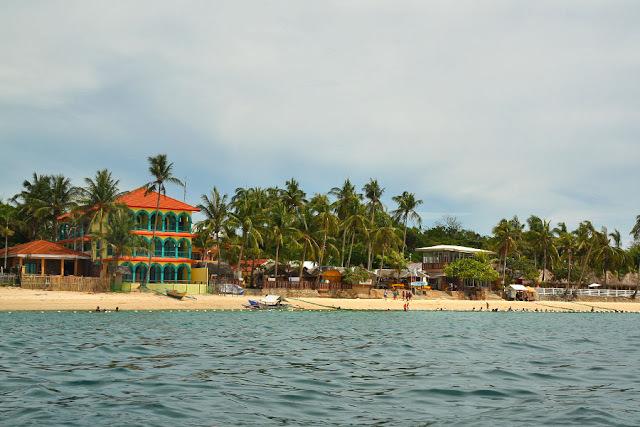 When our three–hour island hopping stint was over (that was all we could afford: island hopping for a group of less than 10 persons was Php 500 for the first hour and Php 150 for the succeeding hour) but have not had enough of the sea, we went for a swim at Alubihod Beach. The sand wasn't very fine but the beach was clean. And even if the tide was out, we didn't have to go very far for the water to reach our neck. Each of the resorts had some sort of net marking their beach territory. I wanted to swim in Alobijod Cove's area where there were only a handful of people, but was afraid somebody would blow a whistle, fish me out by my neck, and transfer me to the center net where my cheapass self belonged. Going to Alubihod Beach from Jordan Wharf: Hire a tricycle [Ronald 0906 760 6285] from Jordan Wharf to Alubihod Beach for Php 250 (Alubihod Beach to Jordan Wharf is Php 300). You can also take the jeepney (Php 30) from the wharf and get off at the junction for Alubihod Beach, then take a motorcycle (Php 15) to the beach. Travel time for the first option will be about 45 minutes, the second option will take longer than an hour as the jeepney makes several stops along the way. We landed in the small island province of Guimaras just twenty minutes after leaving Iloilo on a pumpboat. 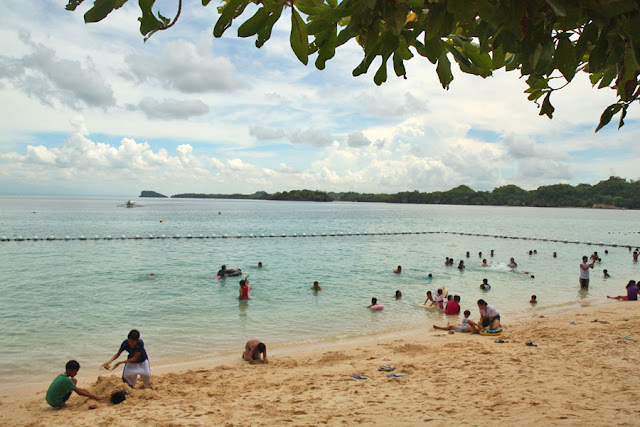 The 604.6 square kilometer island of Guimaras is known for its mangoes, being the sweetest mangoes or so I heard. 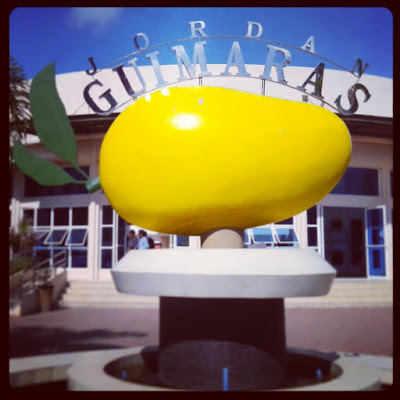 Guimaras has taken that claim to heart and welcomed us with a giant mango. I would have gladly verified the claim right then and there...if only the giant welcome mango were real. This, they say, is the smallest plaza in the Philippines. And who else would be standing in the center of the Philippines' smallest plaza? The big small guy, of course: our Philippine hero, Dr. Jose Rizal! We waved to the big small man as we slow–zoomed in our tricycle. Pitstop Restaurant is known for its mango inspired menu, with its mango pizza being the most famous. But we did not make a pitstop at this restaurant, not because we do not like fruit in our pizza nor fruit in our spaghetti, but because we have already tried its famous mango pizza in their Cebu branch. Fresh mangoes. Dried mangoes. Mango piaya. Mango tart. Mango otap. Cashew. Cashew brittle. These are just some of the food that we could have bought at the market in San Miguel had we had enough money and enough baggage allowance. 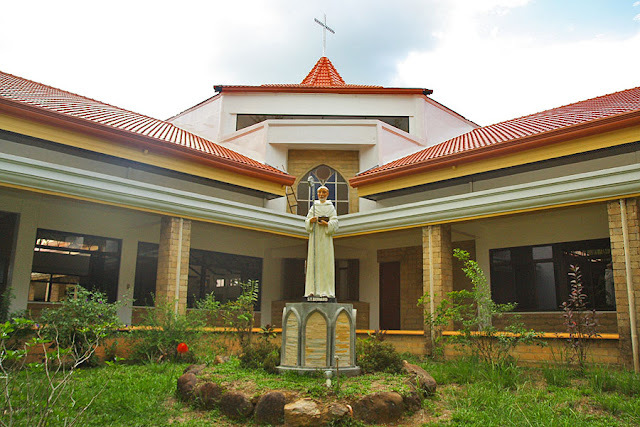 The monastery was established in 1972 and is the only men's monastery of the Order of Cistercians of the Strict Observance (known as Trappists) in the Philippines. The Trappists follow the Rule of St. Benedict and the Benedictine motto "Ora et labora" which means to pray and work. The Trappist Monastery has a church (pray! ), a factory where they make mango bars, jams and jellies, otap, etc. (work! ), a gift shop where they sell their food products, religious items, and souvenir items (work! ), and a guesthouse (for a retreat: pray!). After Trappist Monastery, the next stop on the map would have been Raymen Beach Resort, but we decided to go farther to Guisi Lighthouse. (We added Php 350 for the tricycle for a total of Php 600 from Jordan Wharf to Guisi then to Raymen Beach Resort.) It was a bumpy half hour drive to Guisi from where we were supposed to turn right to get to the beach resort. 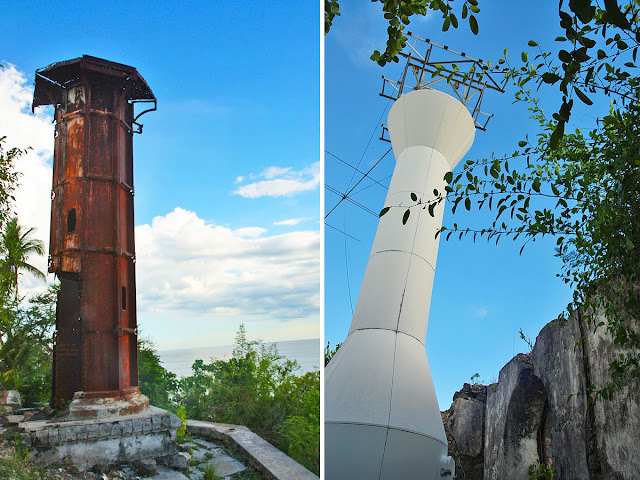 Guisi Lighthouse, also known as Faro de Punta Luzaran, was built in 1896. 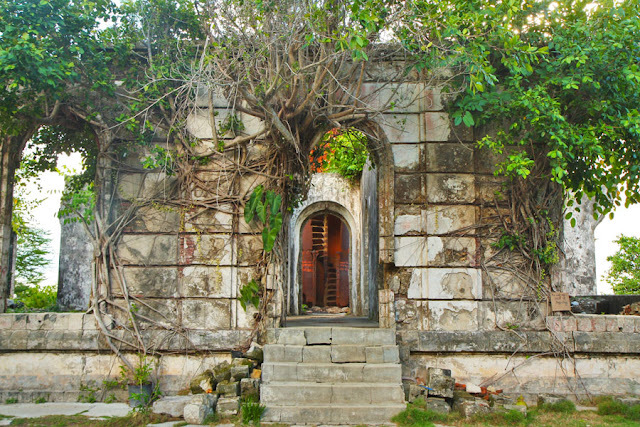 But what is left is its rusty skeleton and the ruins of its surrounding building where roots and plants now cling to. A new lighthouse has been built in the midst of the ruins. We didn't climb up the lighthouse, old or new. One, climbing is prohibited in the old rusty lighthouse...unless you want to get tetanus. Two, somebody alerted the lighthouse keeper that I was coming and he locked the new one. From Guisi Lighthouse we could see a white sand beach below. This is Guisi Beach. We left the lighthouse and made our way down to the beach, passing a gate with a sign "Entrance Fee Php 20," but no one came to collect our money. It was a short walk down to the beach where we found that the sand wasn't fine but the water clear. The beach was deserted; not a soul, visitor or local, was in sight. The resorts in this area, Kenyama Beach Resort, and Guisi Clearwater Water, must be as lonely as the lighthouse above. We left the quiet of Guisi for some civilization in Raymen Beach Resort in Alubihod, Nueva Valencia where we plan to commence our sweet mango verification, catch some zzzs, and embark on a short exploration of some of the islands of Guimaras by boat the next day. Getting to Guimaras from Iloilo: Guimaras can be reached in just 20 minutes (fare of Php 14) either via Parola Wharf (to Buenavista) or via Ortiz Wharf (to Jordan) in Iloilo. 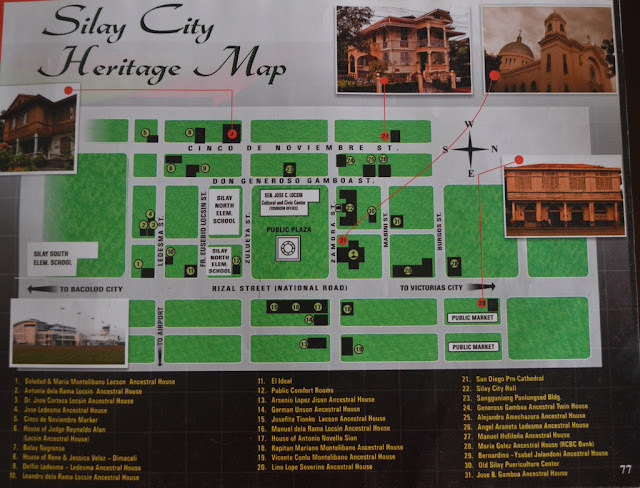 We had obtained a heritage map of Silay City at the airport and our goal that morning was to see each and every house on the map. Because we are OC like that. 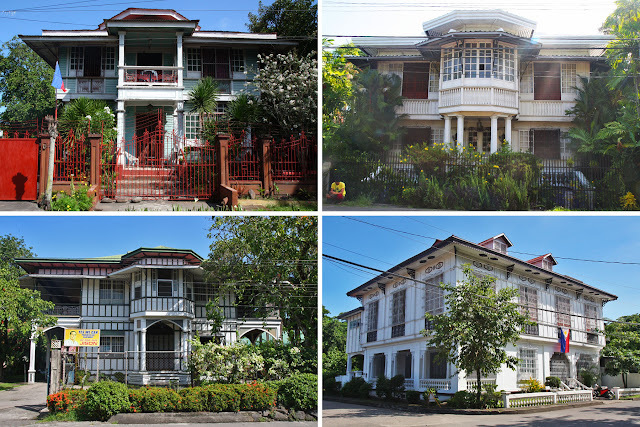 Ancestral homes of (clockwise from top left): Digna Locsin Consing, Teodoro Morada, Jose B Gamboa, and Alejandro Amechazura. We strolled every street on the map and gaped at over twenty grandiose houses of yesteryear. 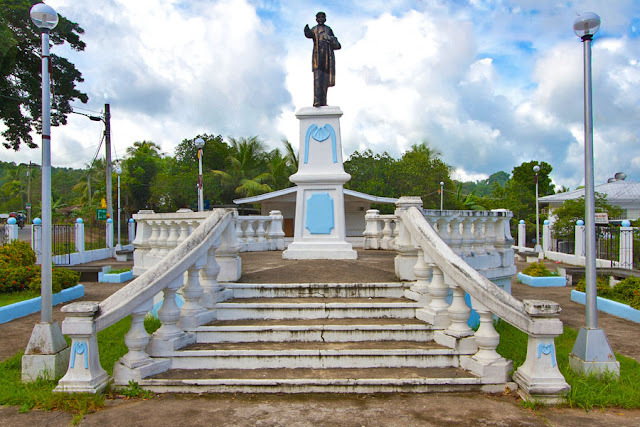 (Silay City reminded of the town of Taal.) Of the more than twenty ancestral homes we found, only three are open to the public. 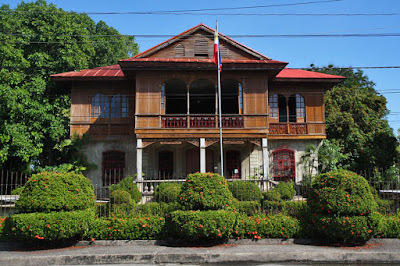 Balay Negrense was completed in 1901 and was the home of the sugar baron Victor Fernandez Gaston. 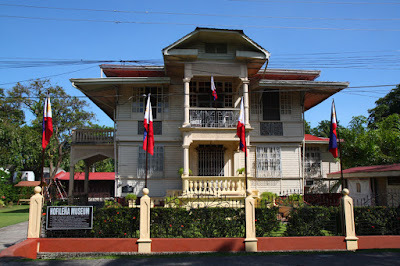 Two blocks from and on the same street as Balay Negrense stands the Hofileña House which was built in 1932 by Manuel Hofileña. His son, Ramon, currently resides in the house, but visitors and strangers are welcome after 10AM, though it is recommended to have an appointment (but we were lucky to have been welcomed in without one). 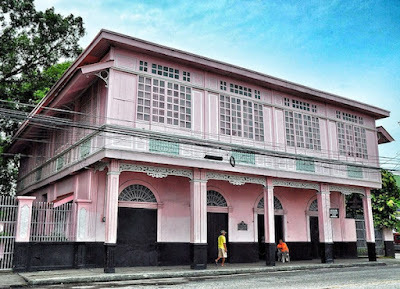 The Bernardino Jalandoni house (or as the locals like to say, the "pink house") was built in 1908, and like Balay Negrense, it is now a museum. This time I joined my friends in touring the Bernardino Jalandoni house (because I have not been here before!). The living room, dining room, kitchen, study room, toilet, and bedrooms were all on the second floor. The tour guide didn't really say much about the history of the house nor about its owners, but just showed the different things in the house that were from another country (like the embossed tin ceiling, water filter, and glassware) or things that were older than me (like the piano, gramophone, and...most of the things there). On the ground floor there was nothing much to see, just horse carriages; a gallinera, which is a bench with a chicken coop underneath (I thought those were for shoes not chickens! 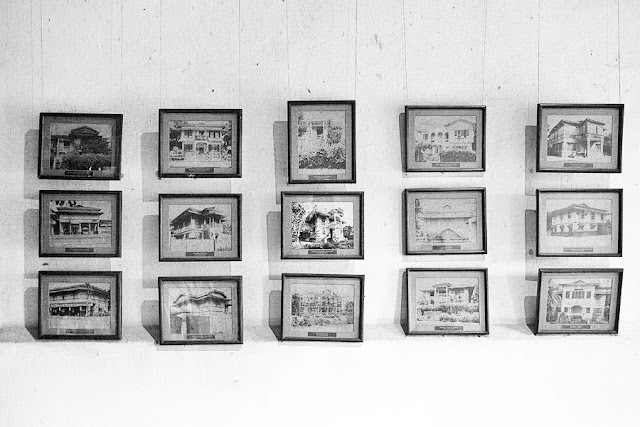 ); a collection of dolls; and old photographs of Silay and Manila. Typical of houses in the 1900s, the ground floor served as the garage. Had I not joined my friends and had I chosen to stay at the ground floor, I think I would have had a good chance of finding something otherwordly. Especially in the dark backroom where all the dolls were kept. Either I should stop visiting old houses or stop watching horror movies. If they find out I'm chicken, it would be to the gallinera I go. 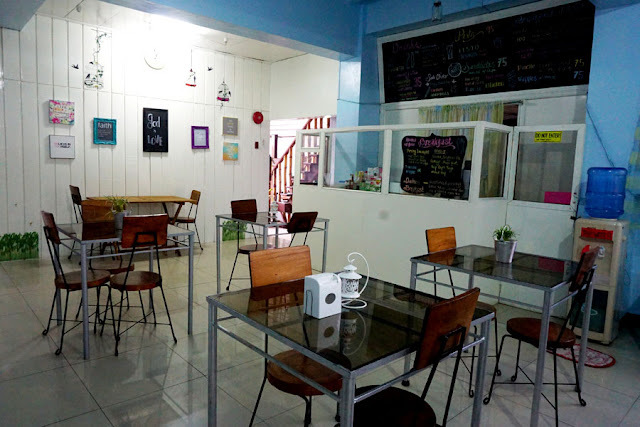 For our few hours in Puerto Princesa City, we didn't have any specific plans, except to eat lunch at KaLui Restaurant (always on the itinerary no matter how many times we have been to Puerto Princesa City) before catching our flight home. 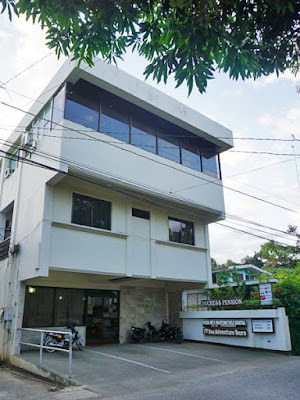 With a few hours to waste in between breakfast and lunch, we decided to visit Palawan Museum, which was just a five–minute walk from where we were staying. 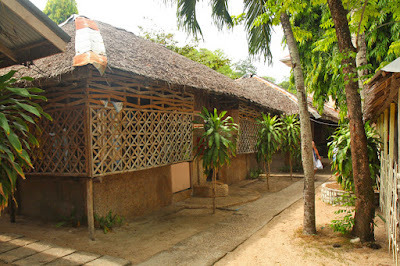 This modest museum displays bits and pieces about Palawan. 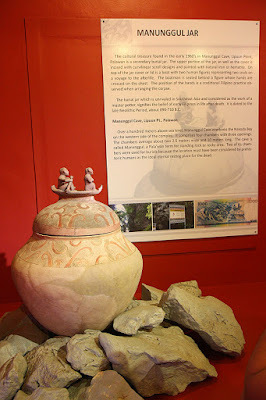 From information about Tabon Cave in Lipuun Point, Quezon, Palawan, where the oldest known human skeletal remains in the Philippines (Tabon Man) was found, and the Manunggul Jar, a secondary burial jar with a lid with two human figures representing two souls on a voyage to the afterlife, that was found in Manunggul Cave, also in Lipuun Point. 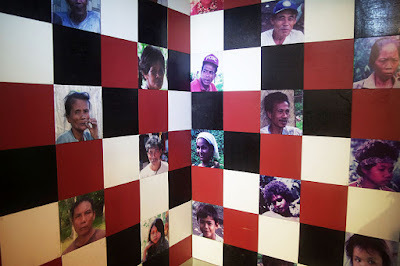 To information about the indigenous peoples of Palawan—Tagbanua, Pala'wan, and Cuyunon—and their practices. 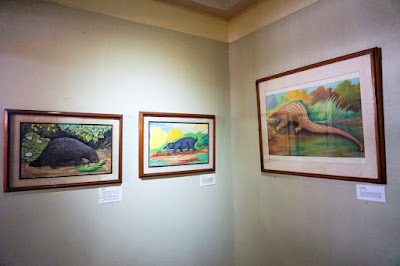 And some information about Palawan's wildlife (depicted through paintings) such as the anteater, porcupine, Palawan hornbill, and stink badger or skunk (that could knock out a dog or a man with its fart!). A replica of the Manunggul Jar. 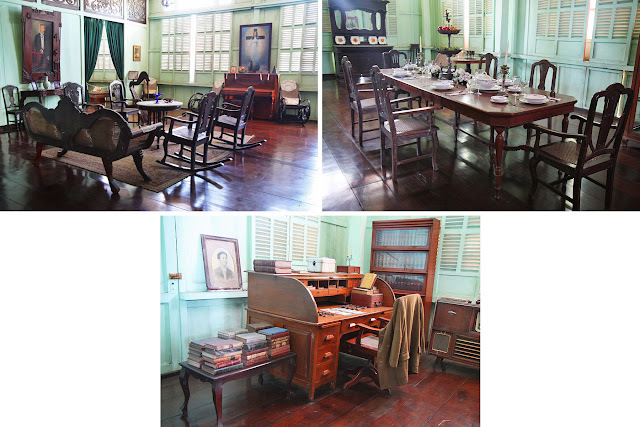 You can find the original in the Museum of the Filipino People in Manila. 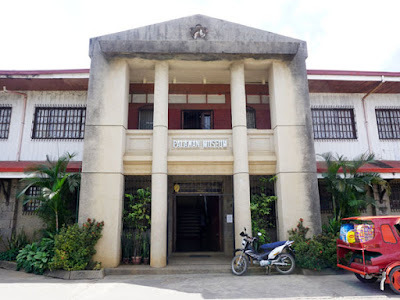 Palawan Museum is small, but as with almost every museum visit, one needs to have the patience to read some lengthy descriptions to get the most out of your visit. We didn't feel like dukes and duchesses when we walked in Duchess Pension. Nobody greeted us "Your Grace." Nobody carried our bags for us. And we all crammed into a 5–person room. But that is not Duchess Pension's fault. We chose to stay in a pension house after all, not a 5–star hotel. And we are not complaining. 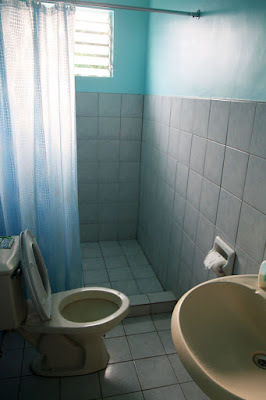 Duchess Pension met our simple needs: a clean room with a clean toilet. Our five–person room had a working air conditioner and a TV. 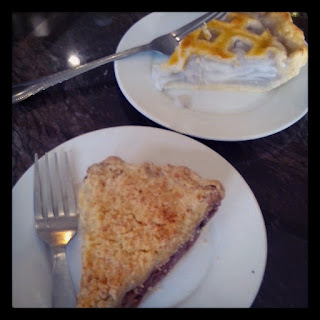 The rate of Php 1750 also included breakfast. A very good deal. The pension house at the time of our visit was quiet. It was either low season or everyone was out enjoying the sights and sounds of the island, such as the Palawan Wildlife Rescue and Conservation Center, Palawan Museum, Honda Bay, and Underground River (to name a few), which the pension house can also arrange for its guests. Who can resist such a creepy book cover? The series, Miss Peregrine's Peculiar Children, is written by Ransom Riggs. Yes, that's the author's name. Sounds peculiar? Just like his books. The story begins in the first book, of course, where sixteen–year–old Jacob journeys to an island and discovers Miss Peregrine's Home for Peculiar Children. Peculiar children such as an invisible boy, a girl who floats if not for her lead shoes, a boy who has bees in his stomach. After reading Miss Peregrine's Home for Peculiar Children and Hollow City, I have two things to look forward to: The release of the third book, Library of Souls, this September (I cannot wait to know what happens next). And the Tim Burton movie, based on the first book, this March September 2016 (Tim Burton and strange things are a perfect match). I am blessed with a built–in flotation device around my middle that it would be difficult for me to become a diver. I'd probably have to put on a truckload of lead weights to make me sink. So, no, I am not a diver. And a diver's haven is not my place. Truth is, I just cannot afford to get certified nor am I brave enough to delve deep into Poseidon's world. I am perfectly content just floating about on my back, squinting at the sun. Or floating about on my belly, pretending to be a big ole whale, peering down at the little sea creatures. No, a diver's haven is not my place, but I can still lurk in the fringes of their haven. 1. Nemo doesn't give me a hard time finding him. 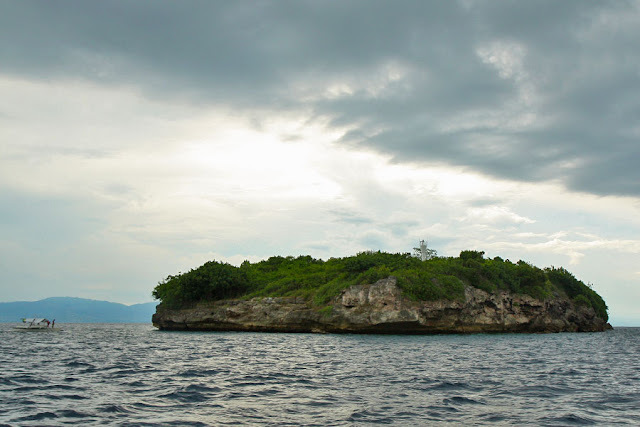 The waters around Pescador Island is his playground along with his colorful friends. 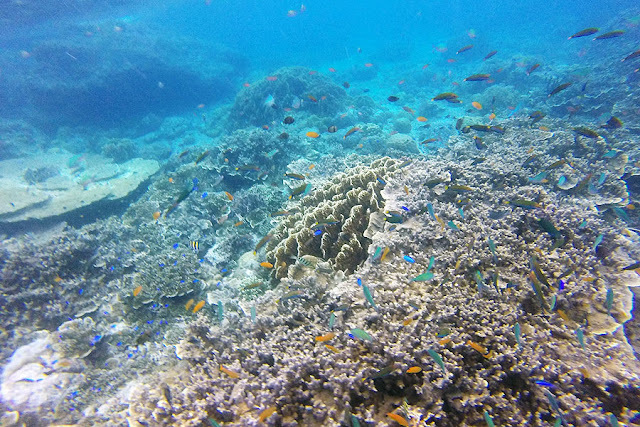 They can be seen, too, just a few meters off the shore of White Beach or Basdaku, and at the marine sanctuaries of Moalboal, such as Tuble, Tongo, and Saavedra. 2. The fish are most hospitable. Their colorful homes at Saavedra Fish Sanctuary and at White Beach are open for everyone to visit. All they ask is for each and every guest to be respectful and not touch or step on their homes, please. 3. Nemo's friends Squirt and Crush and all their relatives laze about in Moalboal's Pawikan (Sea Turtle) Area. We spied eight of them one afternoon, including Crush. Crush was so big that a person near him looked so small. Crush is wider than two persons put side by side. Honest. 5. You get a surprise on your birthday. And it's not an iPod. Poseidon must have favored our friend so much that when we embarked on her little birthday boating trip one late afternoon to see the above four, he sent us a welcoming committee: a pod of dolphins! Moalboal has two main beach areas: Panagsama Beach or Basdiot (where there is no sand), and White Beach or Basdaku. If you're into scuba diving, go to Basdiot where there are many dive shops that can assist you in your dive expeditions. If you're into sitting around on a white sandy beach, go to Basdaku. There are many accommodation options in Basdiot or Panagsama Beach, and only a dozen options in Basdaku or White Beach. Boating can be arranged through your accommodation. Boating costs Php 2000 to Php 2500 for up to 10 persons and usually takes about 3 to 4 hours. Best time to go see the sea turtles or pawikan is during low tide. I guess so you can spot them better when it isn't so deep? Sardines are waiting to show off their glimmer a few meters from the shore of Panagsama Beach. Go and be dazzled by them in the morning or early afternoon. Mask and snorkel can be rented from dive shops in Panagsama Beach or Basdiot. Do not follow this itinerary. I repeat: Do not follow this itinerary. 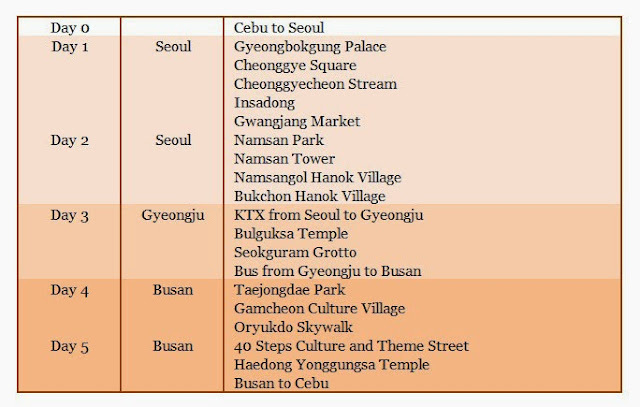 Although very doable (obviously, since we did it), Seoul and Busan deserve more than two days. Gyeongju, too, deserves more than a day. Squeezing in too many cities in too short a time. Do not follow this itinerary! Note that, in Busan, I had very generous friends who sneakily paid for my meals and voluntarily bussed me around the city. Had I not been so blessed with such sneakily generous friends, this trip would have cost me around Php 18,000, not including airfare (my plane tickets are always promo fares) and visa processing fee (if there is no South Korean consulate in your area and you have to process your visa through an agency; the visa itself, if staying for 59 days or less, is free). Three cities in just five days was five days too short. I wish I had more vacation leaves and more money to spend in South Korea. But I didn't. And this means I shall return for a third trip. Maybe in a year or two. Fingers and toes crossed. My five days in South Korea was too short, but never lacked in the awe–inspiring kindness of the Korean people. My mind was muddled with the lack of sleep that I could not grasp the easy user interface of the ticket vending machine for the all–stop train. After two failed attempts, a stranger using the machine next to mine, without my asking him to, helped me purchase a ticket. We found ourselves at the garden of a church while looking for our airbnb accommodation. In short, we were lost. We asked for directions from the first guy we saw. He wasn't familiar with the address, but he searched for it on his mobile, which took a good 10 minutes of his time. In a subway in Seoul, my friend and I stood in front of a sign for several minutes trying to decide whether to go left or right. A kindly old stooped gentleman, sensing we were disoriented, stopped and spoke in Korean. Not a word in English, but we, somehow, understood him, and I told him which station we were going to. He gave us directions through hand gestures. And to make sure we understood, he repeated his action–instructions twice more. At Gwangjang Market, we sat beside a man in a black bubble jacket. We asked him what was the best food and, because he could only speak English in bits and pieces, he answered by ordering bindaetteok (mung bean pancakes) for us. Halfway through my bindaetteok, I looked over their plates and eyed green chili peppers stuffed with meat and vegetables (gochu jeon). My friend could not resist and asked if the green chili peppers were any good. We were to find out as man–in–black–bubble–jacket enthusiastically placed some of his gochu jeon on our plate. He also offered us makgeolli (a traditional rice liquor), but we declined. At Gyeongju Express Terminal, I was glad to find a locker to leave our heavy bags in before we went to see Bulguksa Temple and Seokguram Grotto...but the locker had no English instructions, just Korean words and a tiny drawing. I asked the nearest person I saw—an elderly gentleman—how to use it. Though he couldn't speak English, he patiently taught us, through actions, how to use the coin operated locker. The subway system in Busan is different from Seoul's. In Nopo Station in Busan, we had to reset our brains while buying from a ticket vending machine and took longer than the normal time it takes to buy a ticket. The guy beside us noticed and, without our asking, helped us with the ticket purchase. Unlike the subway tickets in Seoul which are RFID cards, the single–journey subway tickets in Busan are paper tickets, kind of like the tickets in an arcade. On our first night in Busan, at Nopo Station, my friend inserted her ticket at the turnstile, and continued on her way. The same guy who helped us purchase the tickets came running to her to hand her her ticket, which she had not taken back when she entered the turnstile. I was looking forward to seeing my friends who are based in Busan: SangCheol, Yong, and ByeongUk. I had met SangCheol back in 2010 when he studied English in Cebu. Yong and ByeongUk, I met in 2013, when they, along with SangCheol, came to Cebu for a vacation. For my visit in Busan, to meet them over coffee or lunch or dinner would have been more than enough. On the morning of our first day in Busan, SangCheol picked us up at the hostel. I did not expect him to drive us around Busan all day. But that he did, with Yong riding shotgun. (ByeongUk was out of town on a business trip.) 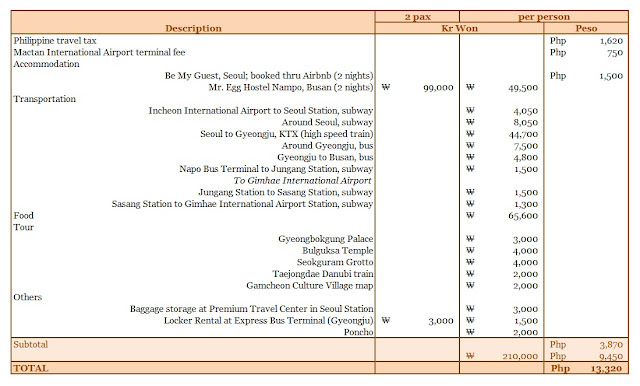 On top of that, he and Yong sneakily paid for everything: the Taejongdae tram ticket, lunch, snacks, and dinner. And would refuse our offer to pay. Every time. At a parking area in Gamcheon Culture Village, SangCheol slowed down behind a car that was getting ready to park. But the car in front was just inching along though there were no other cars blocking its way. Yong, who was sitting shotgun, got out of our car and approached the driver's side of the car in front of us. In five seconds the lady got out and Yong got into the car and maneuvered the car into a parking slot. When I asked him if he knew the lady, he said he didn't. He just volunteered to park it for a stranger. While walking along the main street of Gamcheon Culture Village, we saw a kid stop in front of a gutter and wail. His toy had fallen through the grill and he couldn't retrieve it. Yong approached him, stooped low and lifted the heavy grill to fish the toy out for the kid. We had dinner with SangCheol and SangCheol's friend, Ji In, who we just met that night. (Yong couldn't join us for dinner.) After dinner, because SangCheol was too drunk, he apologized that he could not drive us back to the hostel (nor drive himself home). Riding the subway was not a problem at all for us. While I fumbled with my wallet to buy subway tickets, Ji In had already beat us to it, buying two subway tickets for me and my friend. ByeongUk had arrived the night before and it was he who came to pick us up at the hostel on our second and last day in Busan. SangCheol this time was riding shotgun. (Yong had apologized the day before that he could not meet us again the next day.) ByeongUk and SangCheol took us to Haedong Yonggungsa Temple which was more than an hour's drive away. The day before, SangCheol had asked me what I wanted to eat for dinner. I said japchae (stir–fried glass noodles). It boggled his mind because japchae was just a side dish. He tried to think of a restaurant that had japchae but drew a blank. He asked his friends, but they, too, drew a blank. It gave him a headache. It was hilarious and embarrassing at the same time. But, the next day, after visiting Haedong Yonggunga Temple, he triumphantly gave ByeongUk directions to a restaurant where he was sure had japchae. And there we ate a feast...which ByeongUk sneakily paid for. I really did not expect SangCheol, Yong, and ByeongUk to shove their weekend out the window to chauffeur and show me around. Much less pay for everything. To SangCheol, Yong, ByeongUk, Ji In, and all the random strangers who have helped me, I am grateful. My debt to you is too big and the words thank you too small. Please excuse this Mustache's ignorance but the following things—very ordinary things to the citizens of Busan, I am sure—looked absolutely awesome to me! It was during breakfast at Mr Egg Hostel Original in Nampo that I discovered this neat little innovation for single–serve jam packaging. 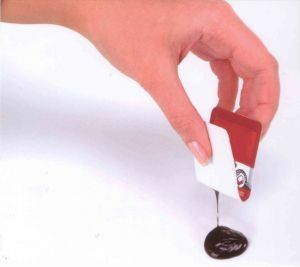 Just fold it in half and the center snaps open, and you can put jam on your toast without getting sticky fingers. Neat! Notice the police car? Not the ones parked at the station. But the police car crashing through the third floor! 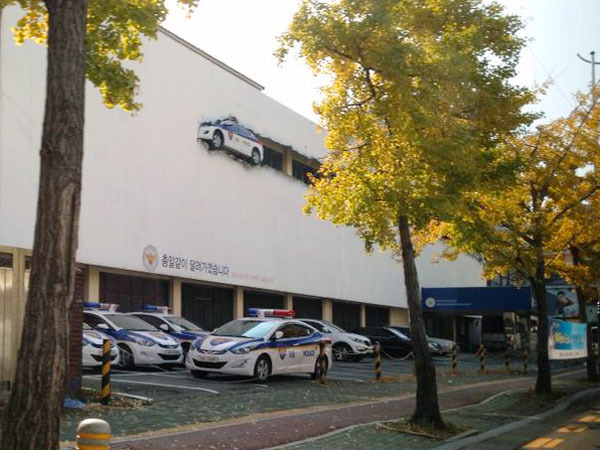 This art installation sends the message that the Busan Metropolitan Police Agency is "faster than a speeding bullet." Cool! From the hostel in Nampo to Haedong Yonggungsa Temple we had to cross three bridges. The first bridge was a short one and didn't leave any lasting impression on me. The second one, though, as we entered it, was like being on a rollercoaster. 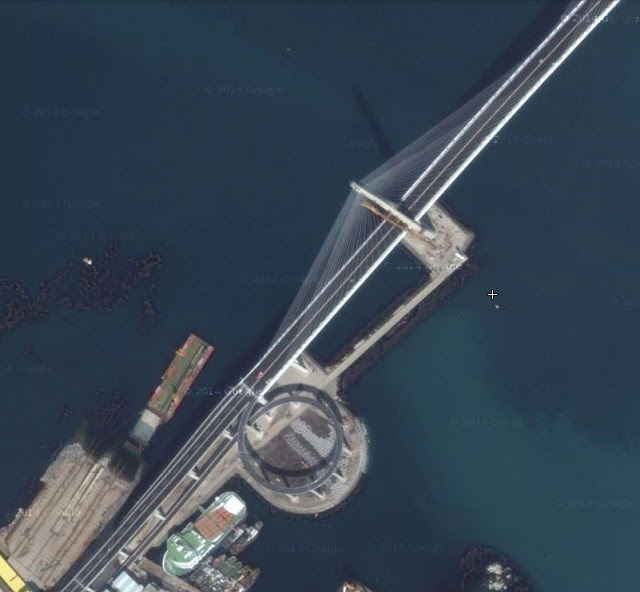 My jaw dropped when we were driving up the looping ramp to get on the Bukhang Bridge (aka Busan Port Bridge). I craned my neck to see what was below it, thinking we were over water. Obviously, it was the first time I have ever seen a bridge that had a ramp like that (the ramp had to loop because it would be too steep if it had gone up the bridge straightaway). And it made me go...Wow! 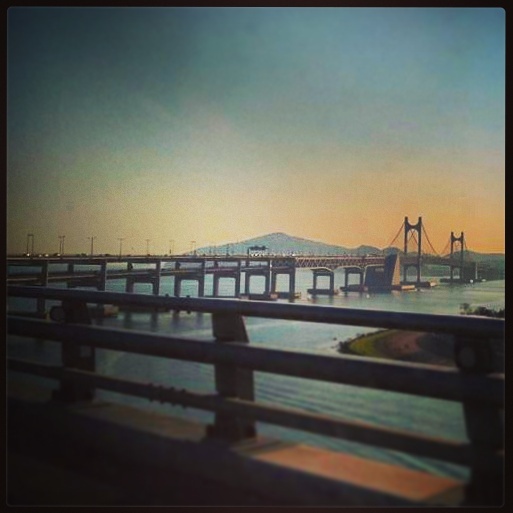 The third bridge we had to cross to get to Haedong Yonggungsa Temple was Gwangan Bridge, also known as Diamond Bridge. On the way to the temple we had the sky above us. And on the way back the sky was nowhere to be seen. Not because we had gone blind, but because we were on the lower level of Gwangan Bridge, a double decker bridge! Amazing! You yawn and ask, "That's it?" Yup, that's it. Told you I'm just a little ignoramus in a big modern city. My Korean friends were puzzled why I wanted to go to Gamcheon Village. They, residents of Busan themselves, have never been there. Gamcheon Village, they said, is one of the poorest areas of Busan. That may have been true back in the 50s, when Gamcheon began as a slum town, filled with refugees as a result of the Korean War. 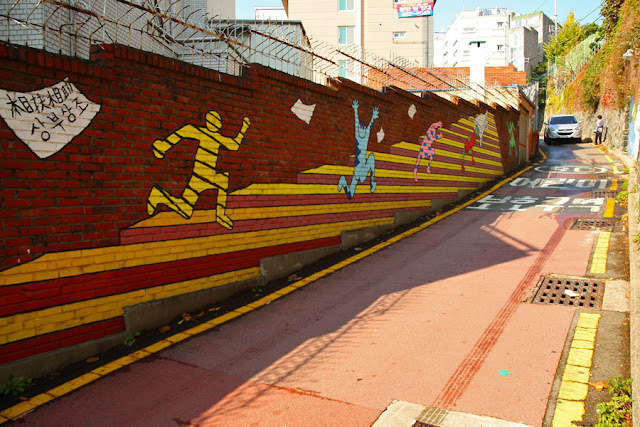 It was in 2009 when Busan's government decided to transform Gamcheon Village into a creative community, hiring artists to create street art. I don't know if Gamcheon Village is still considered to be one of Busan's poorest areas but it sure didn't look like it from afar as we were going up the winding road to the village, nor did it look like it when we were strolling its streets. 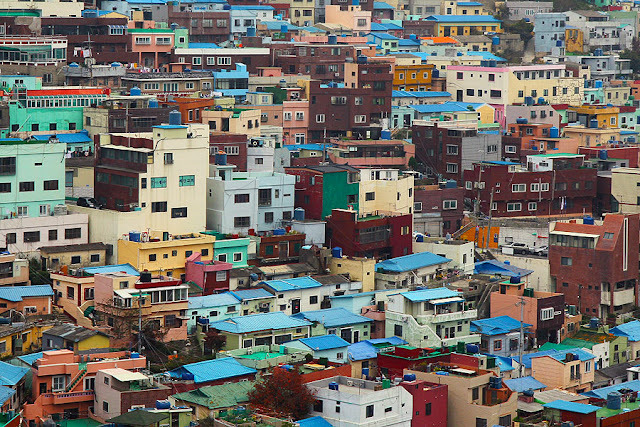 Gamcheon Village was a barrage of colors. From afar, the thousands of little box–shaped houses of different sizes and colors, covering the side of a hill, looked like Lego bricks. Walking the streets of Gamcheon, my head swiveled every which way—anything and everything caught my eye. 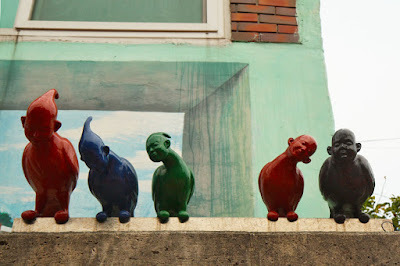 Different colored birds perched on a wall, birds that upon closer inspection looked rather creepy with their human faces. 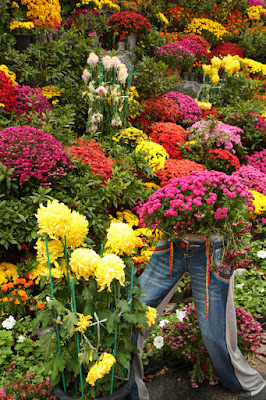 Flowers growing out of trousers. 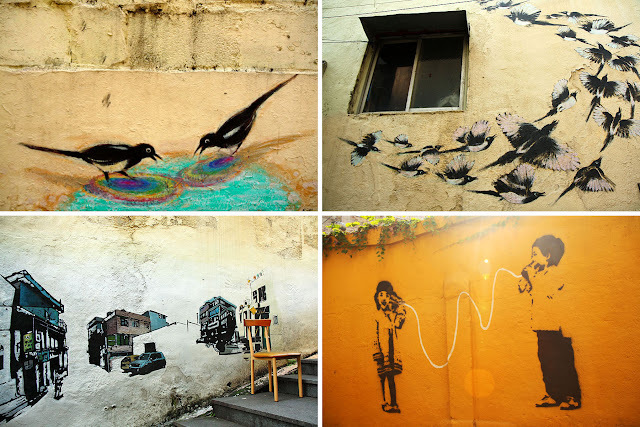 Art installations above the street parking areas. Walls of fish and walls of houses. for there was a long line of people waiting to have their photo taken with the Little Prince. 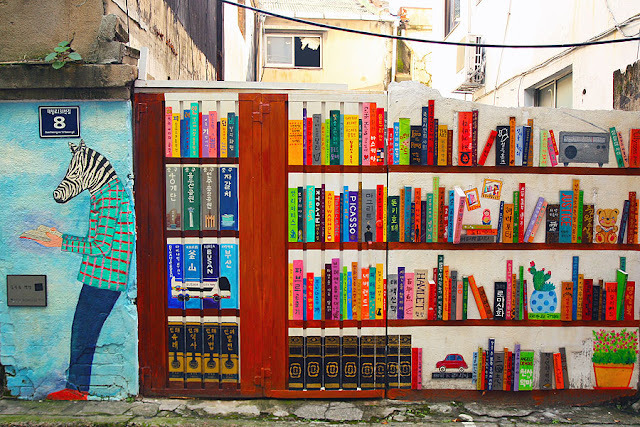 Gamcheon Village is a pleasant place to get lost in with its many many alleys, art shops, cafes, and galleries. It was like walking in a different world. In a whimsical wonderland. Nothing at all like a shanty town that "poorest area" brings to mind. Map of the village is sold at the Tourist Information Center for KRW 2,000. Reminder: Gamcheon is a village of 10,000 residents. Keep noise level at a minimum. And don't go poking about in somebody's home or taking photos of residents. Take subway line 1 to Goejeong Station, Exit 6. Get on local bus Sakha 1 or Sakha 1-1. Take subway line 1 to Toseong Station, Exit 6. Find the bus stop in front of PNU Cancer Center and get on local bus Saha 1-1, Seogu 2 or Seogu 2-2. From our hostel, Mr Egg Original, in Nampo, we took more than 40 steps to go back to the time of the Korean War at 40gyedan-gil (in English, it translates to 40 Steps Street), a street which is actually two streets at a right angle to each other. 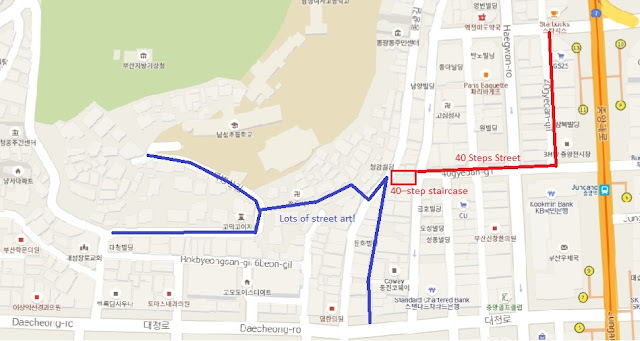 (The starting point of 40gyedan–gil is just two blocks from Mr Egg Hostel Nampo, its end point just a block away from the hostel.) 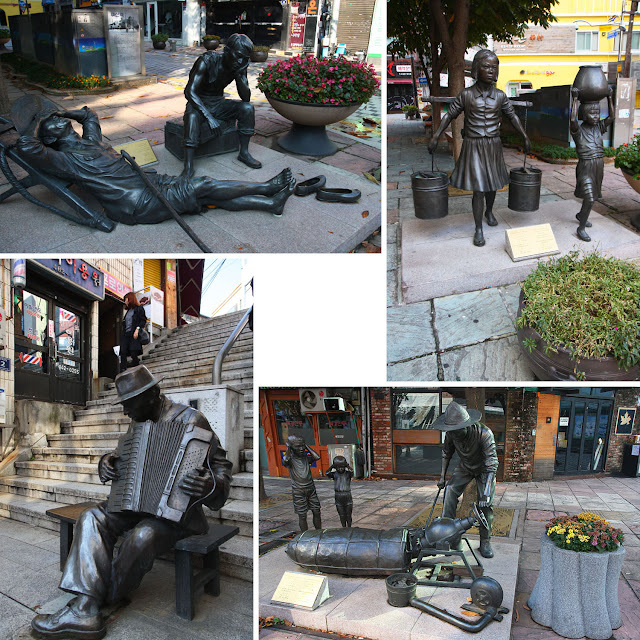 This street is dotted with sculptures reflecting the life during the Korean War. It ends at the 40–step staircase that has a sculpture of an accordion player. We explored this place early in the morning on a Sunday when it was quiet and deserted. We took our sweet time walking this short street—just 450 meters—and checking out every sculpture we came across. Our sweet time just took 10 minutes. But our ten minutes stretched to an hour when, from the top of the 40–step staircase, another set of stairs caught our eye: one with a mosaic of dolphins and birds. Out of curiosity we climbed up a few of its steps and found a map on the wall. 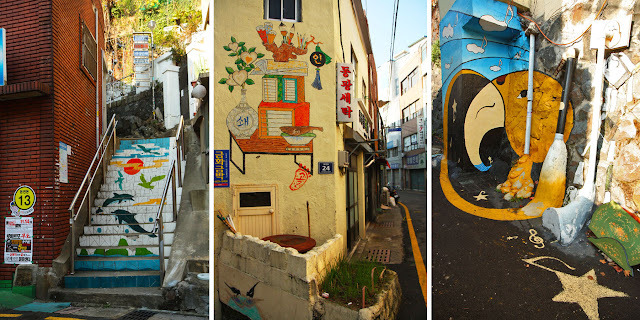 "The 2nd Street Art Festival" were the only English words on the map, the rest was in Korean. 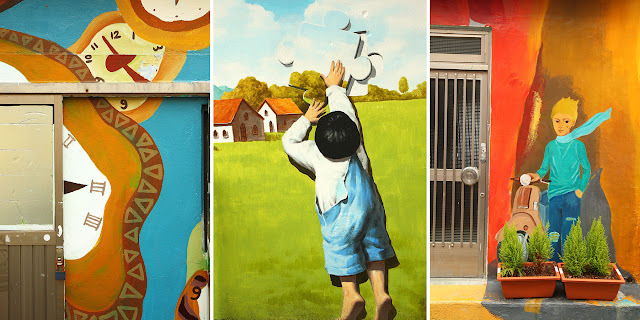 Thus our exploration of the right–angled street of 40gyedan-gil extended to several alleys snaking through residential areas where we found a treasure trove of colorful street art. 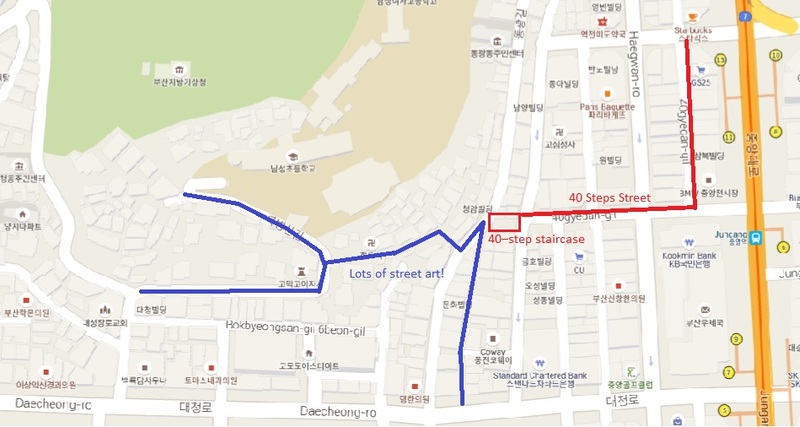 Directions to 40 Steps Culture and Theme Street: Take subway line 1 to Jungang Station, exit 13. 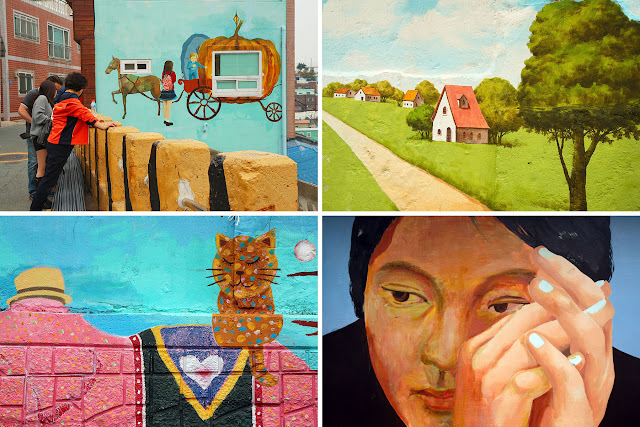 This article combined with the Gamcheon Culture Village article is also featured on GPSmyCity. If you find this article useful and plan to use it to explore Busan, for a minimal fee, you can download the GPSmyCity iOS app to view it offline and use the GPS-aided map.